Making kids jump for joy since 1996! 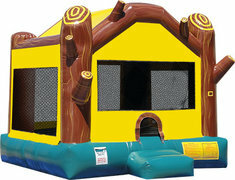 This moonwalk is perfect for many differently themed parties including jungle themes, dinosaur themes, lumberjack themes and animal themes. 3...2...1...BLAST OFF!!! 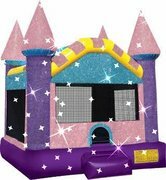 Your guests will have a blast bouncing in this space themed moonwalk, complete with control panel graphics both inside and out, as well as a rocket shaped roof. Dazzle your guests with this sparkling castle! Unwrap the fun with this gift box moonwalk! 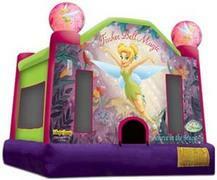 This Disney Princess castle is fit for a little princess! It's party time and everyone's invited! 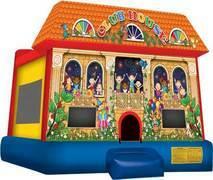 This fun Party Playhouse bouncer is bright and colorful and works well with a variety of different themes. 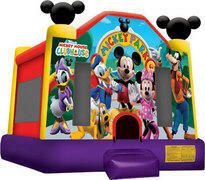 Bounce along with Mickey Mouse, Minnie Mouse and the whole Disney gang. This jumper features Mickey, Minnie, Donald, Daisy, Goofy and Mickey Mouse's faithful pup Pluto. 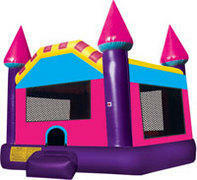 This pink and purple dream castle is perfect for your little princess! 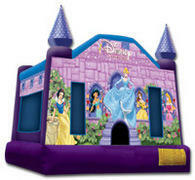 Works well for Beauty and the Beast, Sofia The First, and Cinderella, as well as other princess themed parties. This round moonwalk has inflatable candles on top. Make a Wish!! 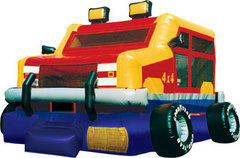 This giant inflatable vehicle will drive your guests to pure fun! All of your guests will believe in fairies after jumping in this magical moonwalk! 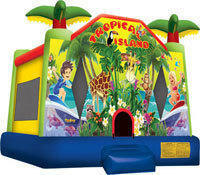 This tropical island moonwalk with inflatable palm trees is perfect for a luau! 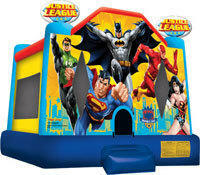 With Superman, Batman,Wonderwoman, Flash, and Green Latern this Justice League moonwalk will not only save the day but will be the hit of the party! 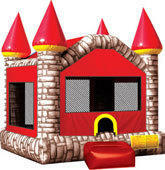 Your guests will feel like royality in this fun Camelot castle! Are you ready kids? 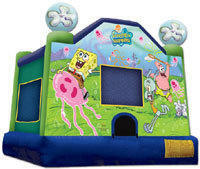 This Spongebob moonwalk brings the pineapple under the sea to dry land! 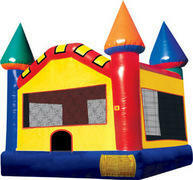 Relive medieval times as you jump around in this multi-colored castle!